True West Magazine selected us Best Historic Town Tour for 2016 and 2017!! Sidewalk medallions and statues along Dodge City’s Trail of Fame commemorate the city’s famous and infamous denizens—and the actors who have portrayed them. Some celebrities have signed and left handprints in the concrete near their medallions. Pick up a map for the free walking tour at the information center. The Trail depends on charitable donations to remain open and active. You can help with a tax deductible contribution! Our latest project, the stunning life sized bronze sculpture of Matt Dillon (James Arness) by famous sculptor Tony Cipriano, is now in place on the southeast corner of the Visitor's Center. The Dodge City Trail of Fame has erected a stunning life sized sculpture of iconic actor James Arness (Matt Dillon). Artist Tony Cipriano of Long Island, New York is the sculptor and both the maquettes (miniatures) and the life sized version are cast a Degginger's Foundry, Topeka, KS. 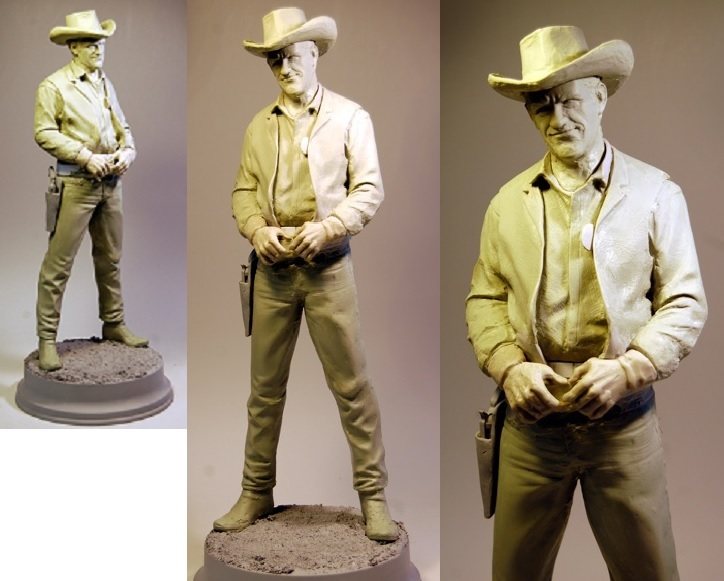 To help maintain this statue we can accept your generous donation in return for which you will receive a 22" miniature (maquette) of the statue or an 11" bust of Matt Dillon in one of several different materials. A portion of the donation is tax deductible as a charitable contribution. These are already becoming popular items and there will only be 20 of them! The first of which has been given to the Arness family. Click HERE for more information and to order yours before they are all gone! Commemorative Ruger Revolver - Get Yours Now! Our current fund raising drive includes sale of a numbered special edition Ruger Vaquero in Deep Blue with gold lettering and white grips. READ HERE! There will only be 50 of these commemorative revolvers and over half of them are already gone. Contact us ASAP to reserve yours!